These pages are best viewed with browser set for full screen viewing. 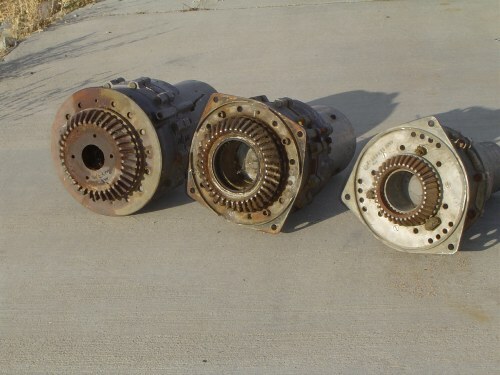 These motor & gearbox units were used on WWII and Korean War era aircraft for controlling the pitch angles of the propellers. The bullet shaped canister sticking out in front of the propeller houses the "Power Unit Assembly", which is what Radio Amateurs commonly refer to as the "prop pitch motor. " This unit is actually an electric motor plus a gearbox. Most of these units were made by the Curtiss-Wright Aircraft Co. These things make very powerful and reliable antenna rotators when they are properly prepared. 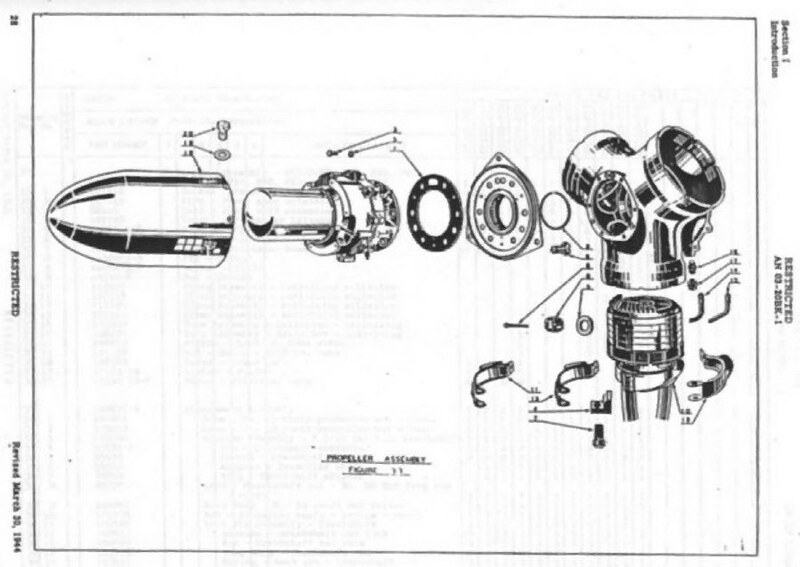 Propeller hub assembly diagram for a propeller assembly that used the small Power Unit. The Power Unit is the second item from the left, the bullet shaped thing on the left is an aerodynamic cover. 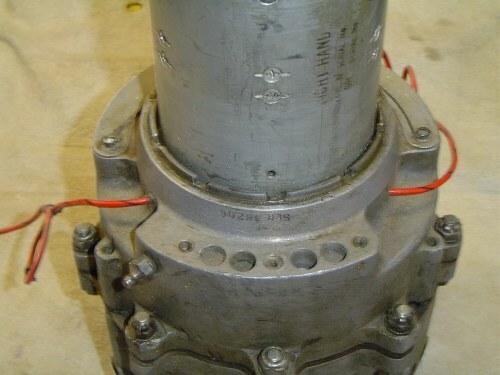 The triangular adapter plate is one of two different types used to mount the small power unit on aircraft. 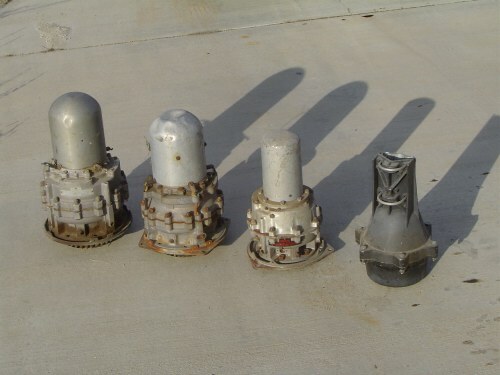 This shows the three prop pitch units next to a T2X "Tail Twister". The small prop pitch is not much larger than the T2X, but it has about 15 times more torque. On the left is the electric motor for the small prop pitch. It is 4.13" Dia x 6.75" long. 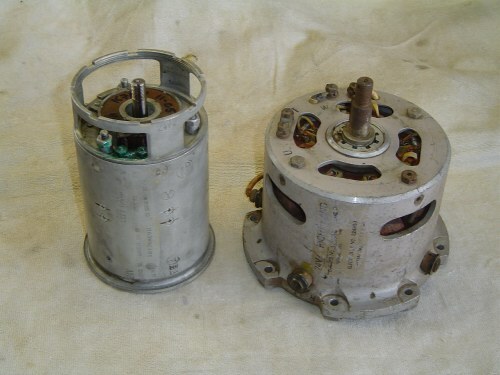 The motor on the right is used on the medium and large prop pitch. It is 5.8" Dia x 5.0" long. 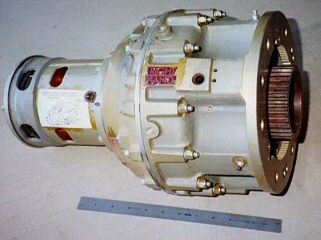 The large motor is mounted to the gearbox with eight 1/4-28 bolts. The small motors are mounted two different ways. On the left the motor is connected with a ring that is bolted to the gearbox with eight 1/4-28 bolts. On the right is a threaded ring that screws into the gearbox to clamp the motor in place. 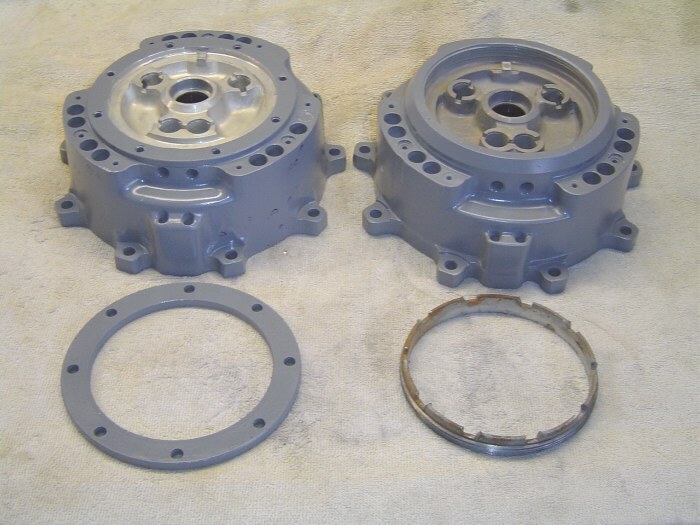 The photo below shows the differences between the forward gearbox case halves for the two methods of mounting the motor. The rear case halves are the same regardless of which motor attachment is used. 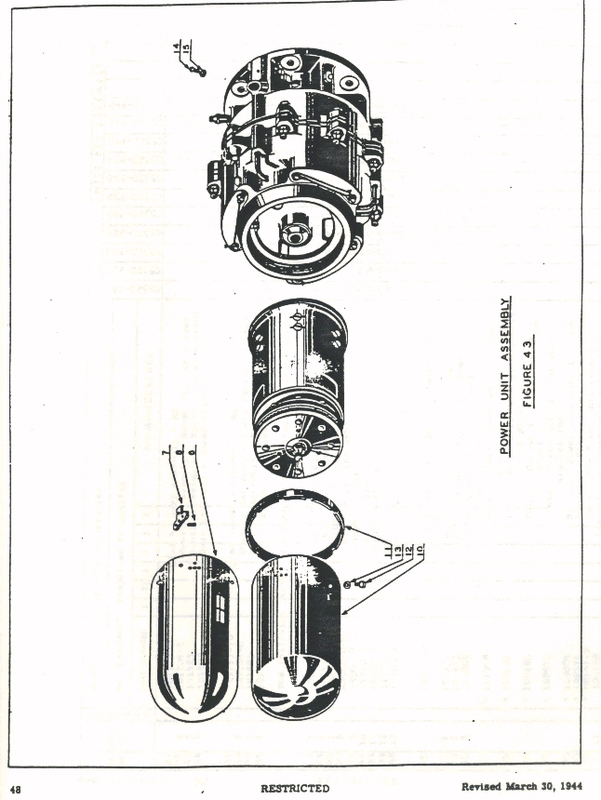 Below is the Curtiss diagram of an early model small Power Unit. It consists of an electric motor and motor cover, and a Speed Reducer (gearbox). This version of the small unit differs from later ones in the motor configuration and electrical connection details. 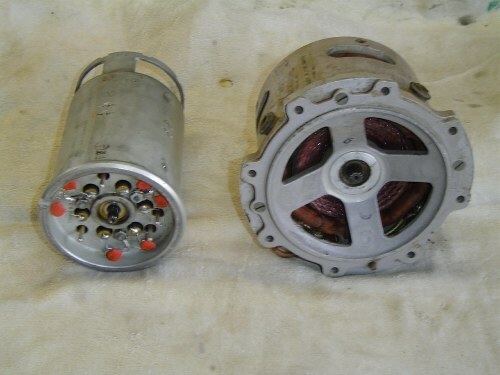 This early model motor had an open motor case at the end connected to the Speed Reducer (gearbox). There are no pins on the aft end of the motor to plug into connectors in the Speed Reducer (gearbox), and therefore there are no power jacks in the gearbox. The wires from the field windings in the motor run directly out through holes in the gearbox. The forward end of the motor where the brake assy is located is different in that there is no removable end cap. 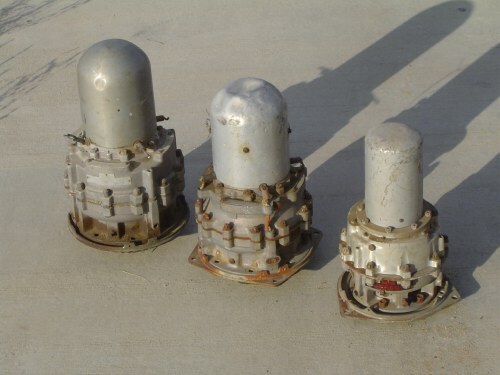 These smaller prop pitch units are the ones most frequently used for antenna rotators, probably due to their availability, and the fact that they fit into the smaller tower sections, like those found on freestanding crankups. The Medium size prop pitch will fit inside 45G/55G tower sections, but a horizontal brace needs to be removed to get it in there. A removeable brace can be easily made that will attach to the tower legs with U-bolts. The large prop pitch fouls on the 45G/55G bracing and doesn't really fit unless the bracing is bent out away from the rotator. The big prop pitch units are probably best used for rotating towers or put in 65G or larger tower sections. An old timer, who worked for Curtiss-Wright once told me that the price of a late model small unit from from the factory was around $3200 in the mid 1950's when they went out of production. Translating that to todays dollars, were are probably talking about some very expensive mechanisms if they were to be manufactured today. These units are probably the highest quality mechanisms ever used to rotate amateur antennas, at least when first went into antenna rotating service. The variety of methods used to adapt them to the task of rotating antennas has been quite varied. Some of the conversions that I have seen were quite nicely done. Others have bordered on gross mechanical malpractice. Many have been completey butchered, or converted in a manner that prevents one from dissassembling everything in order to rebuild the unit when it dies. 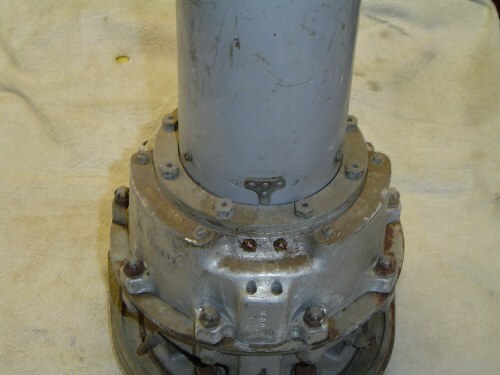 Inadequate gearbox sealing has led to the catastrophic failure of components in the gear train in many units. Virgin Propeller Power Units that haven't been butchered or run into a rusted pile of junk are getting much harder to find. We should cherish them and take care the ones that are left.